Before I got into fashion design, I had no idea how fashion colors were selected. As a student at F.I.T., I learned about Pantone and color forecasting. Pantone 2018 Spring Summer trends feature meadowlark yellow, little boy blue, cherry tomato, blooming dahlia, pink lavender and ultra violet among others. These are fun colors to work with and easily incorporated into a hat or fascinator for the Kentucky Derby or any other event where you want to wear something festive. Newmarket would be a fun choice to showcase that Little Boy Blue color. Newmarket works great with any hair color. 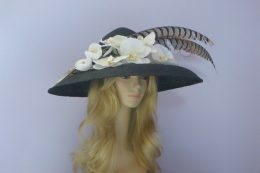 This hand made fascinator features a lace stretched over a base. To bring Arcadia into your Kentucky Derby ensemble, try a dash of Peppermint. This handmade fascinator features Arcadia color lace over a custom Polly Singer base. If you find yourself totally confused as to which hat to pick to wear with any of these colors, try a neutral such as Eclipse. This entry was posted in Hat Tips, Kentucky Derby Hats and tagged fascinators for 2018, pantone 2018 fashion, pantone 2018 fashion colors, sping 2018 colors.